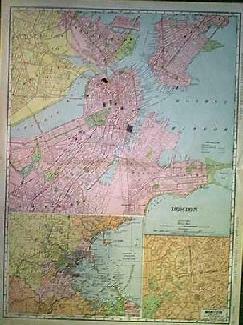 Boston Prints and Maps for sale. 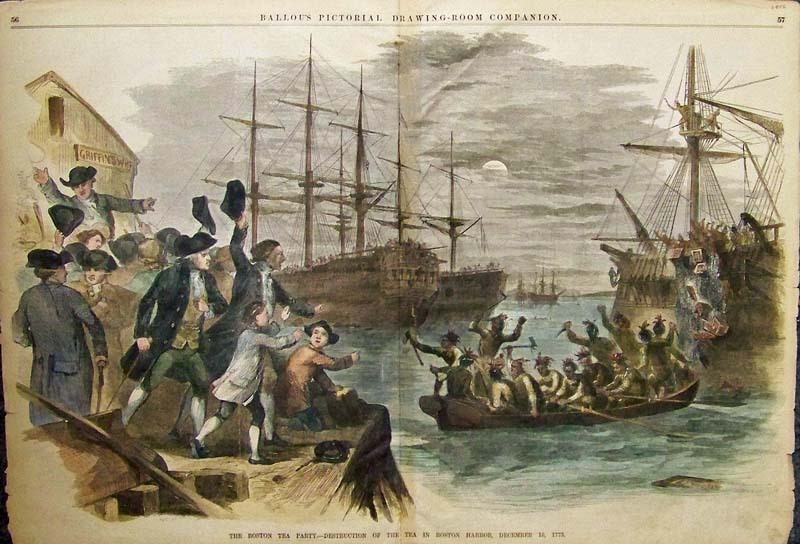 1856 Rare and very early view showing the Boston Tea Party -- Destruction of the Tea in Boston Harbor, December 16, 1773. 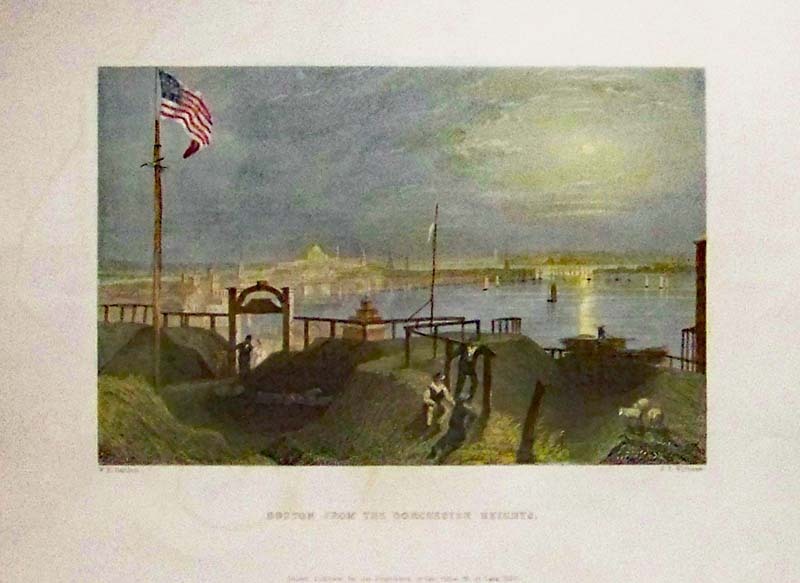 This hand colored wood engraving was featured in Ballou's Pictorial Drawing-Room Companion. 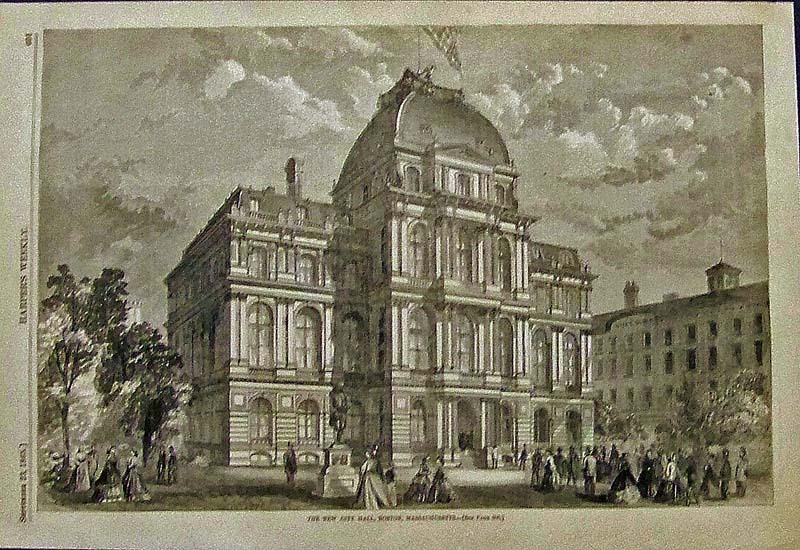 1865 Wood engraving from Harper's Weekly showing The New City Hall, Boston, Massachusetts. 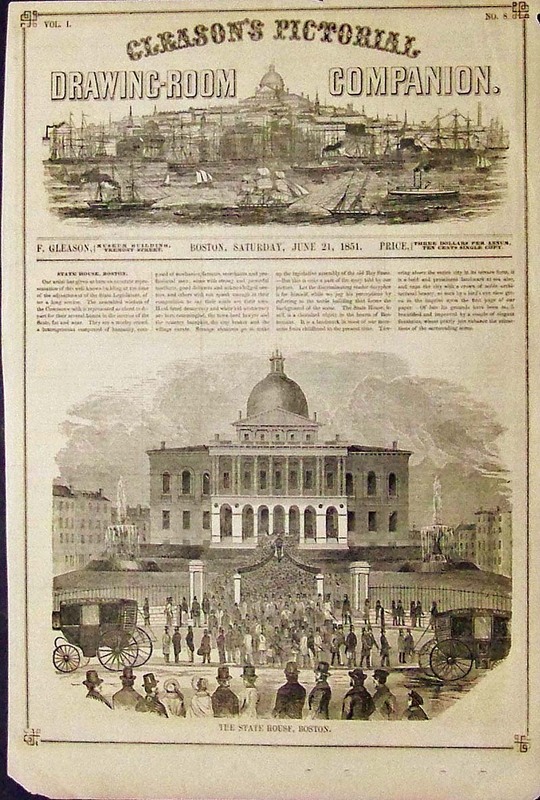 1851 Wood engraving featured in Gleason's Pictorial Drawing-Room Companion showing The State House, Boston. 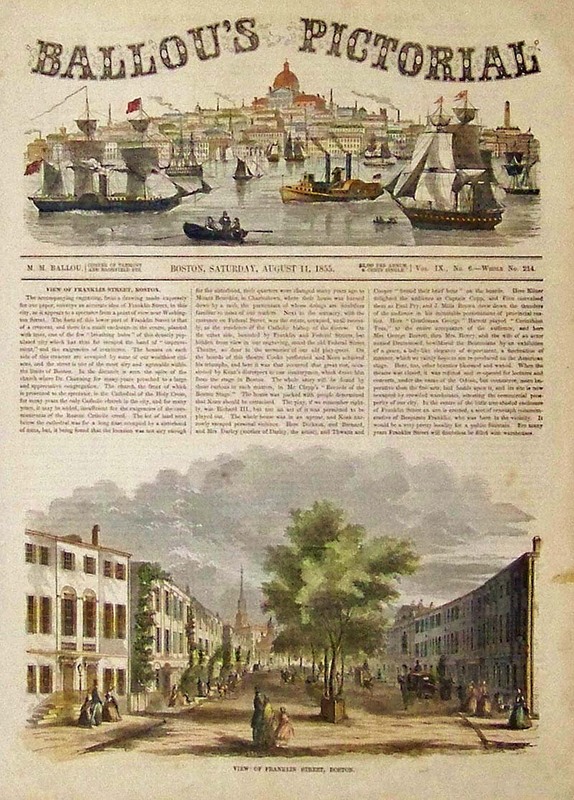 1855 Ballou's Pictorial hand colored wood engraving titled, "View of Franklin Street, Boston." 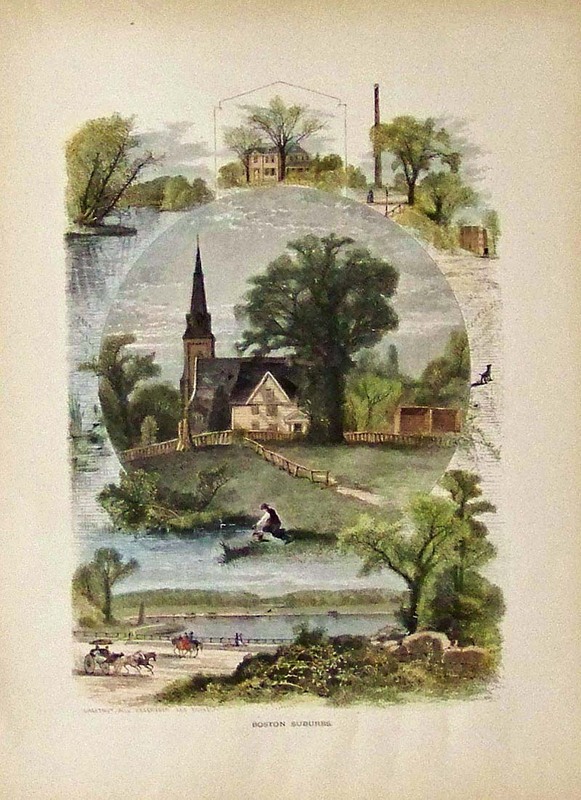 1873 Hand colored wood engraving titled, "View from Steeple of Arlington-Street Church." 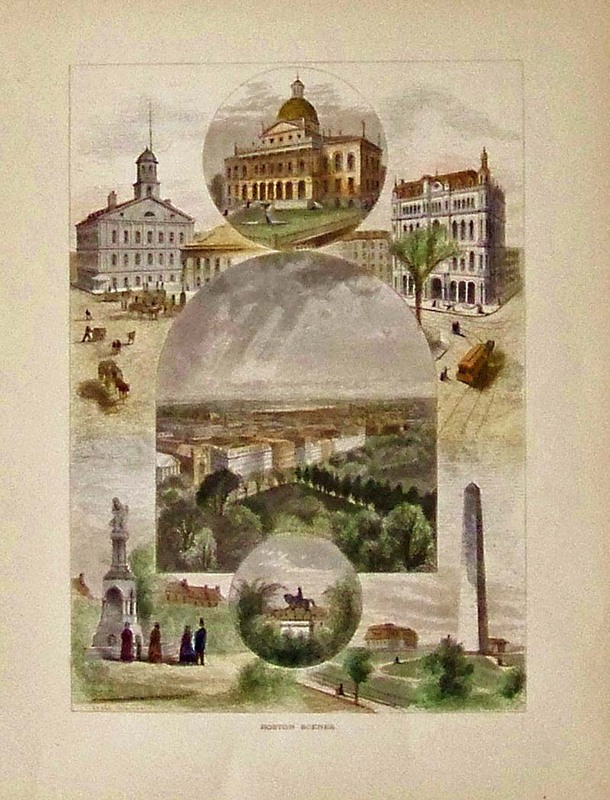 1873 Hand colored wood engraving showing six Boston Scenes. Featured in Picturesque America. 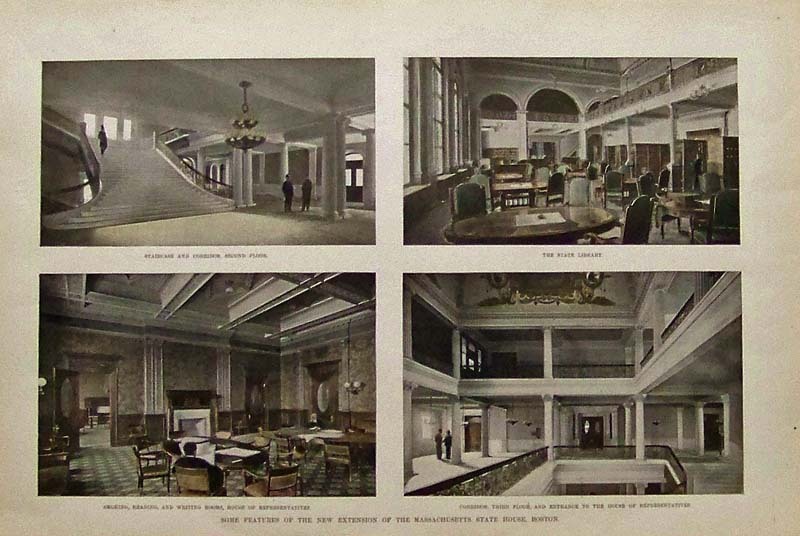 1895 Hand colored half-tones showing four views of "The New Extension of the Massachusetts State House, Boston." The elaborate staircase and corridor, the State Library, the House of Representatives room of leisure and entrance to the House of Representatives are shown. 1880 Dorchester. 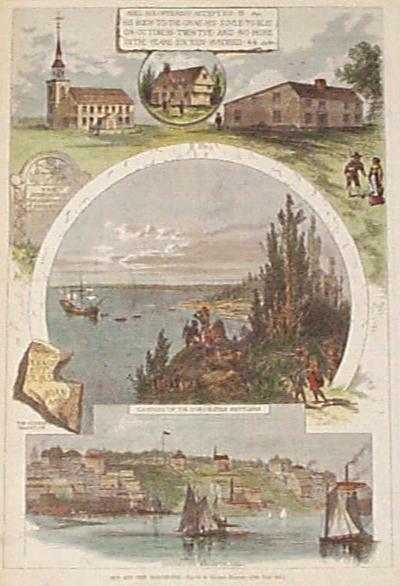 Four views of the historic area on one page. Hand colored. 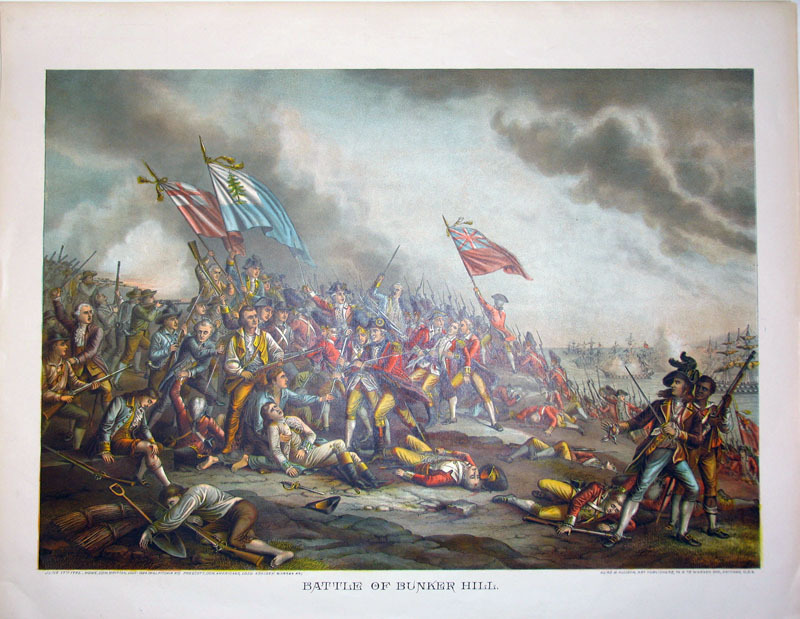 C.1885 Chromolithograph titled, "Battle of Bunker Hill." Published by Kurz & Allison, Art Publishers. 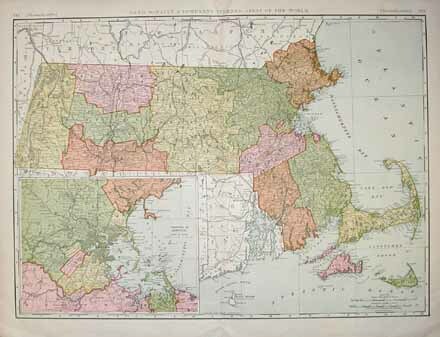 1890 Large Massachusetts Map. In original color by Rand McNally. 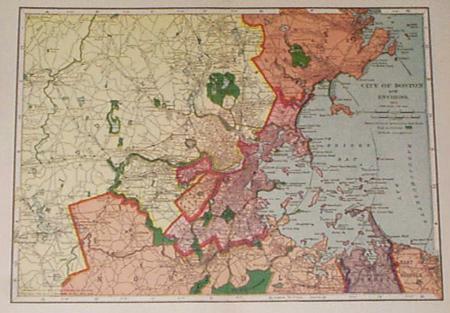 Large inset of Boston. 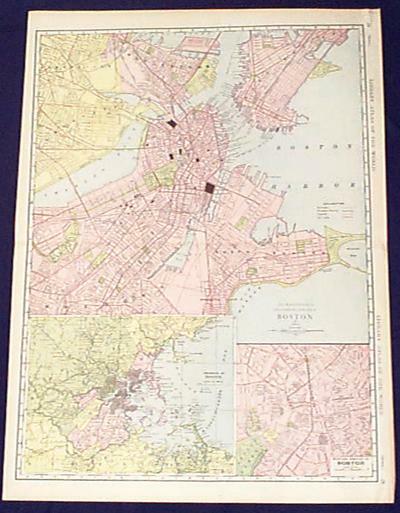 1905 Map of Boston Vicinity. Excellent antique color map from Atlas of the World. Show the City, Harbor and surrounding counties. 1839 W.H. 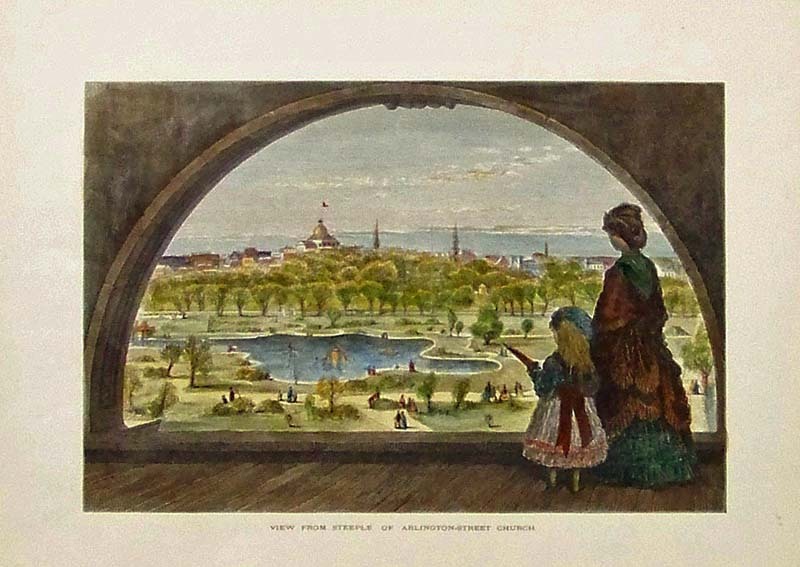 Bartlett hand colored steel engraving showing Boston from the Dorchester Heights. Published by George Virtue. 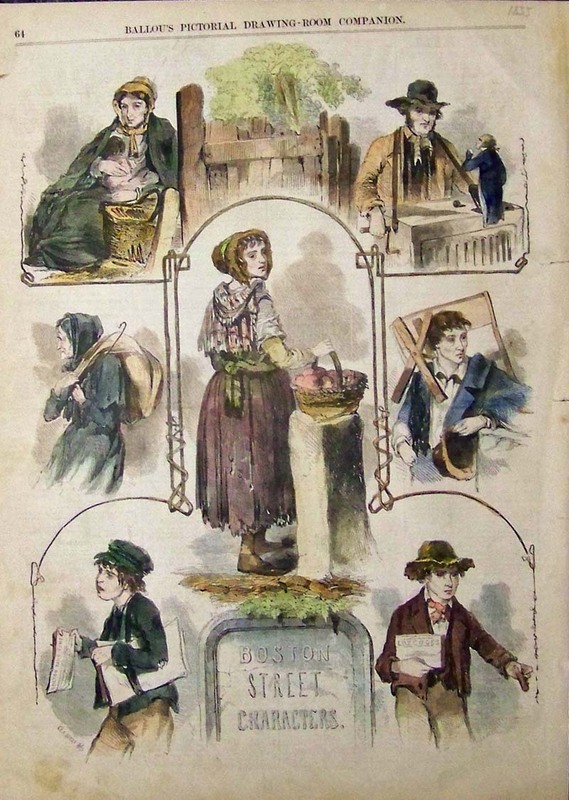 1855 Hand colored wood engraving showing some of the Boston Street Characters. 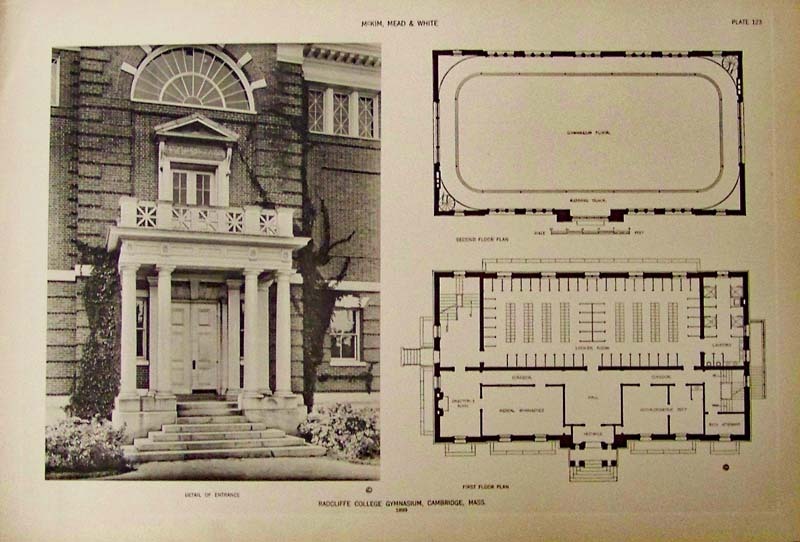 This was featured in Ballou's Pictorial Drawing-Room Companion. 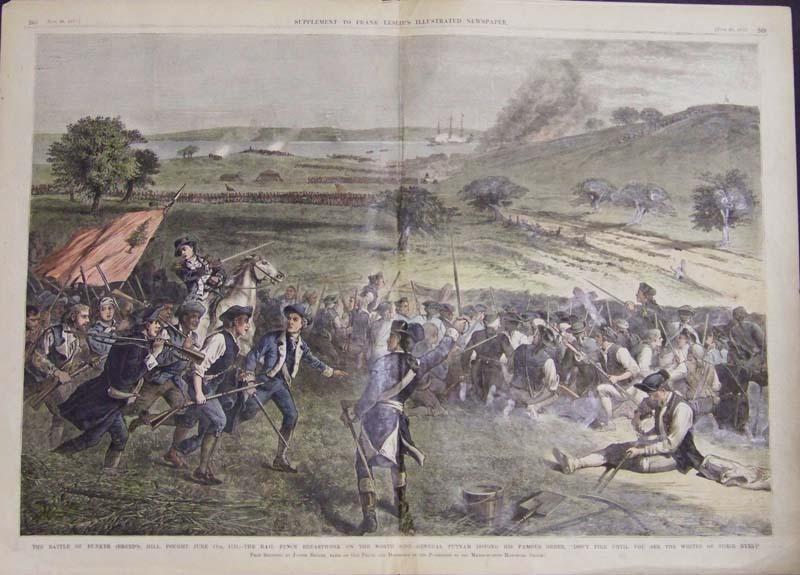 1861 Harper's Weekly hand colored wood engraving showing the Massachusetts Volunteers and The Boston Regiments Embarking for Washington in the Jersey City Cars. 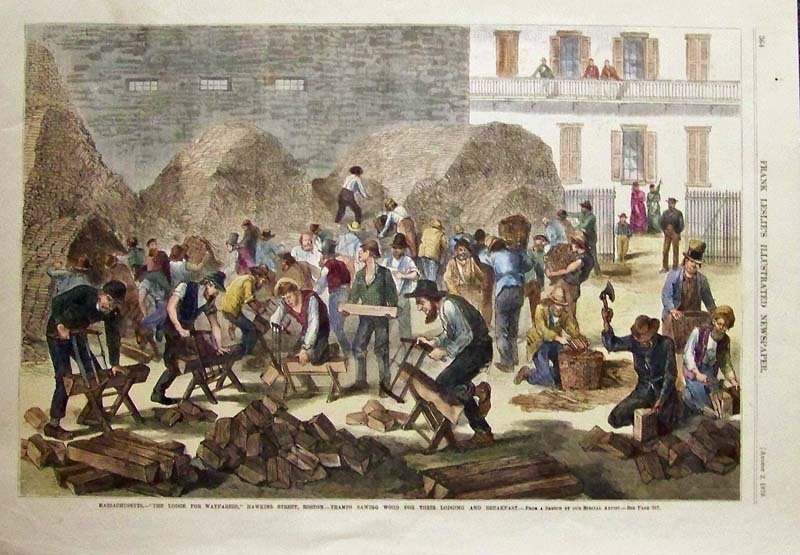 1879 Hand colored wood engraving titled, "Massachusetts, -- The Lodge for Wayfarers, Hawkins Street, Boston -- Tramps Sawing Wood for Their Lodging and Breakfast." Featured in Frank Leslie's Illustrated Newspaper. 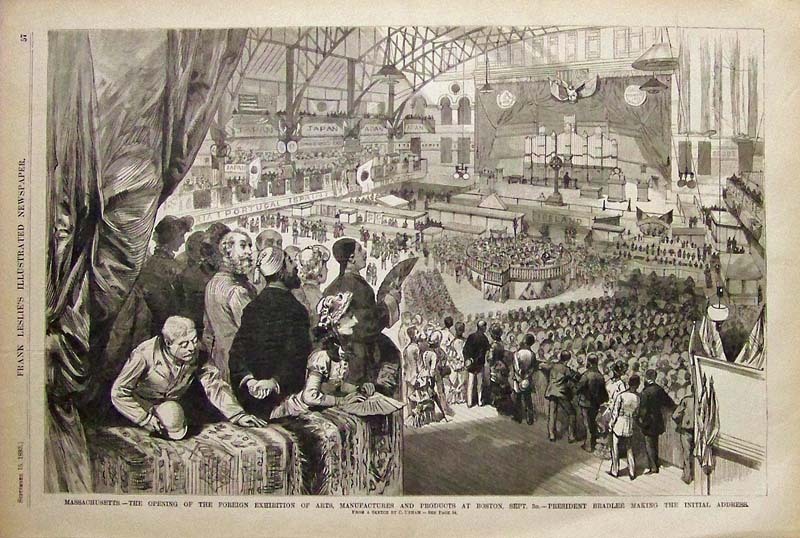 1883 Wood engraving featured in Frank Leslie's Illustrated Newspaper showing the Foreign Exhibition of Arts, Manufactures and Products at Boston, Dept. 3D, and President Bradlee making the Initial Address. 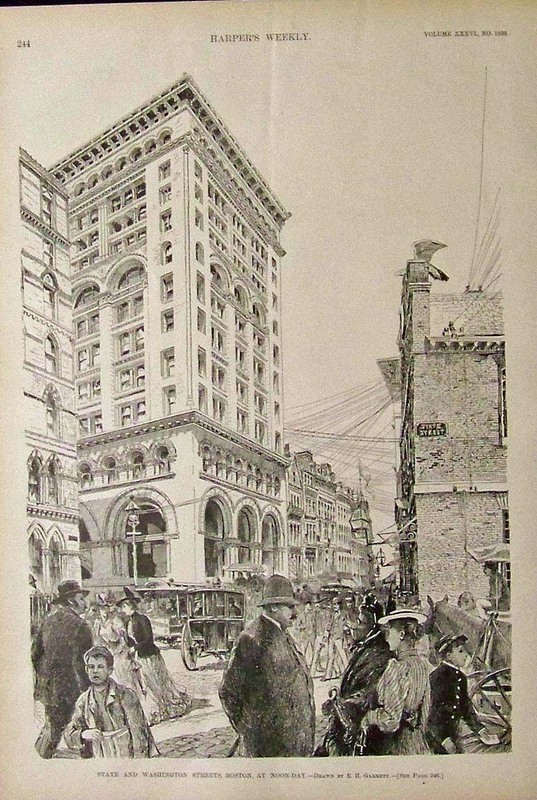 1886 A Relay On The Old Boston Post-Road - Drawn By T. De Thulstrup. 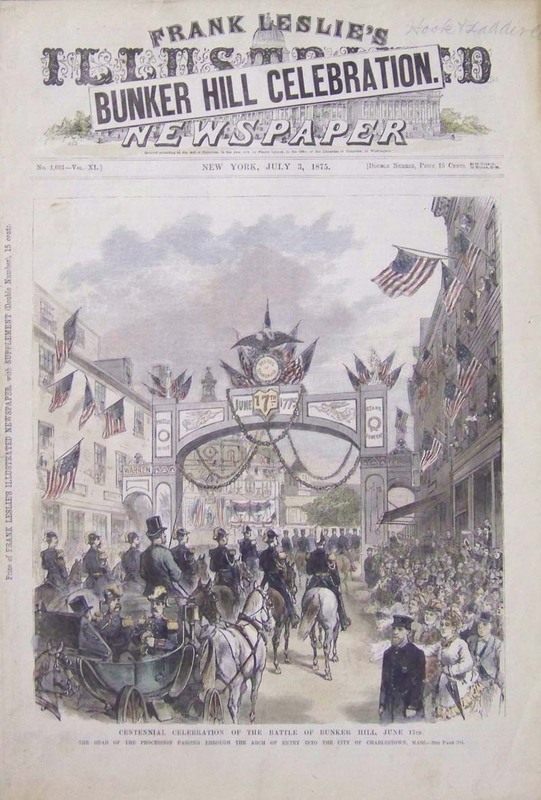 Hand colored wood engraving published in Harper's Weekly on March 6, 1886. 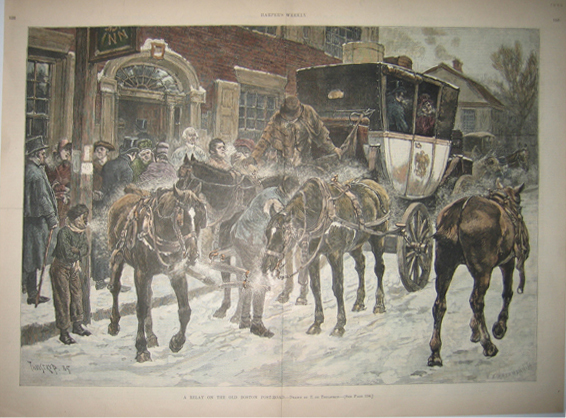 Scene depicts a horse-drawn carriage parked outside a building with people huddled nearby on a cold, wintry day in the snow. 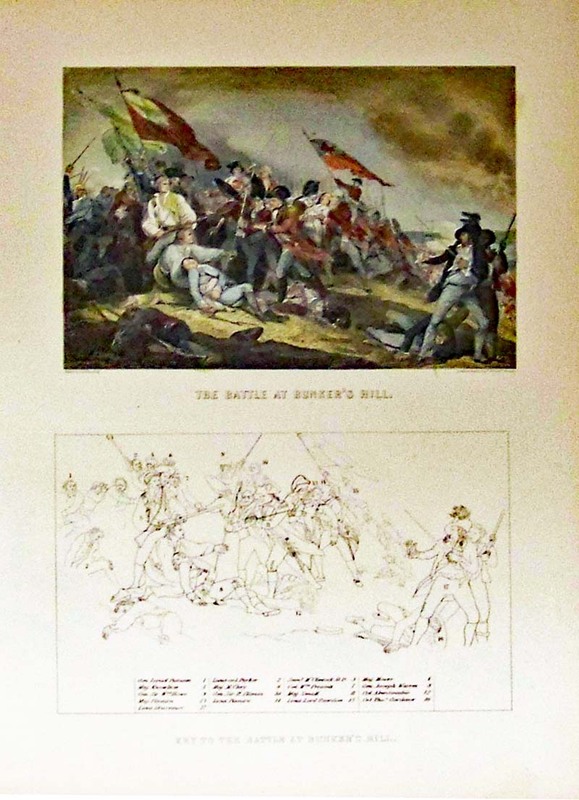 1876 Double-page hand colored wood engraving titled, "The Battle of Bunker (Breed's) Hill, Fought June 17th., 1775. -- The Rail Fence Breastwork on the North Side -- General Putnam Issuing His Famous Order, "Don't Fire Until You See the Whites of Their Eyes!" 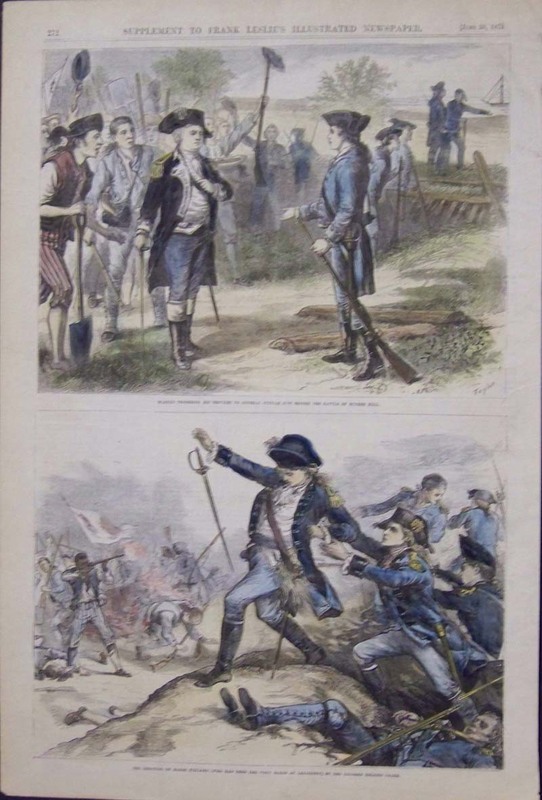 This was featured as a Supplement to Frank Leslie's Illustrated Newspaper. 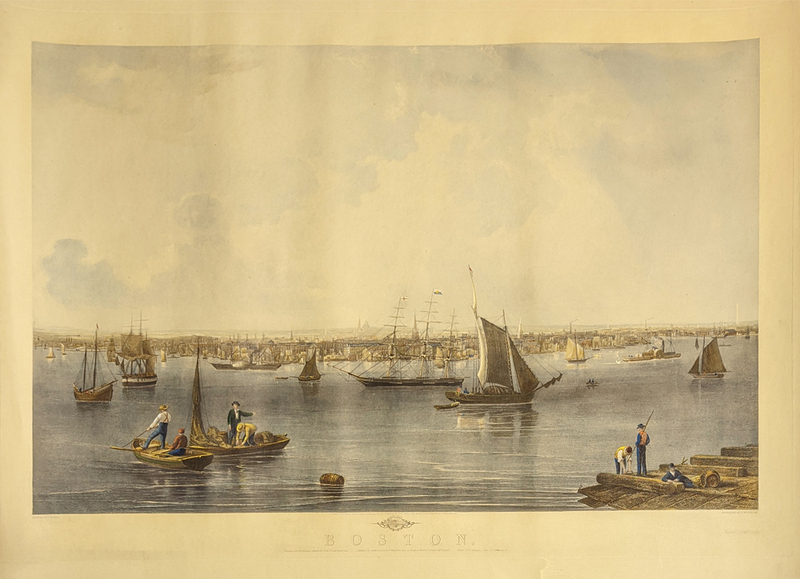 Boston Harbor - Elephant Folio by C. Mottram, published by Smith Bros. after J.W. Hill painting. 1857. Water colored, steel engraving. 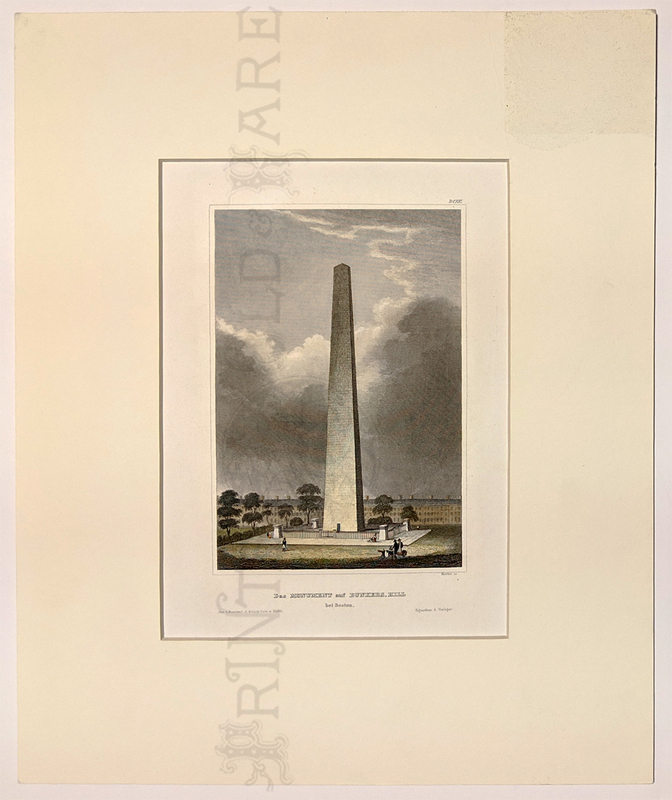 1850 Antique hand colored engraving titled, "Das Monument auf Bunkers Hill, bei Boston." Matted. 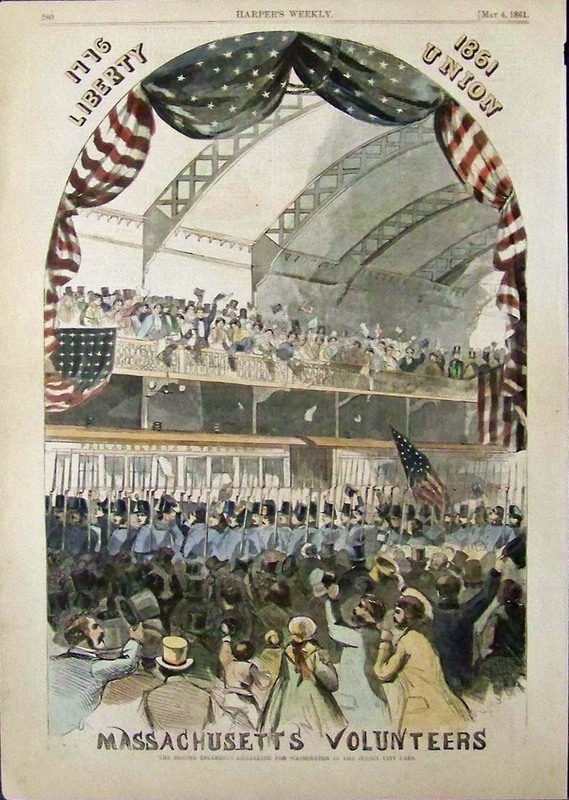 1875 Hand colored wood engraving featured in Frank Leslie's Illustrated Newspaper with the caption banner reading, "Bunker Hill Celebration." on top. 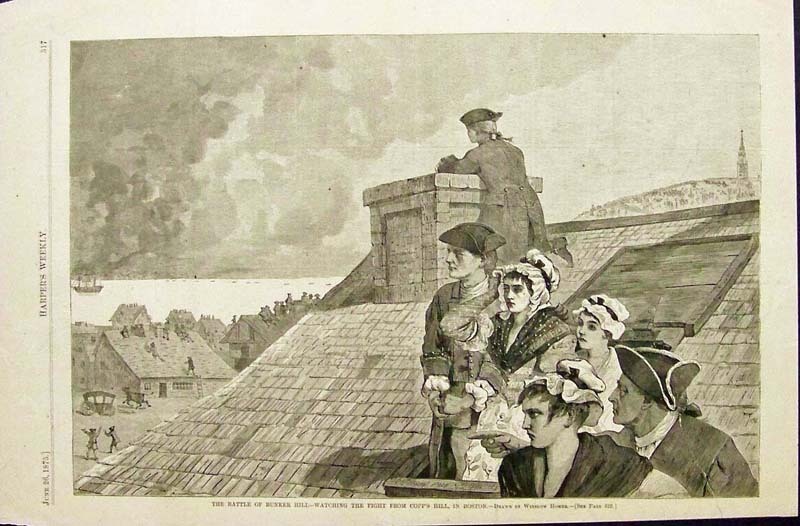 Title of engraving is, "Centennial Celebration of the Battle of Bunker Hill, June 17th." 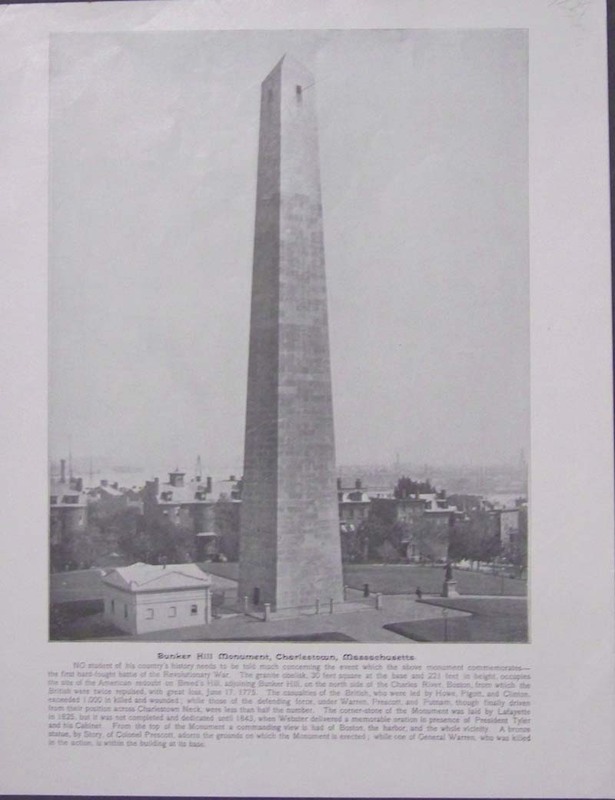 1894 Half-tone showing, "Bunker Hill Monument, Charlestown, Massachusetts," with the history of this monument written below image. 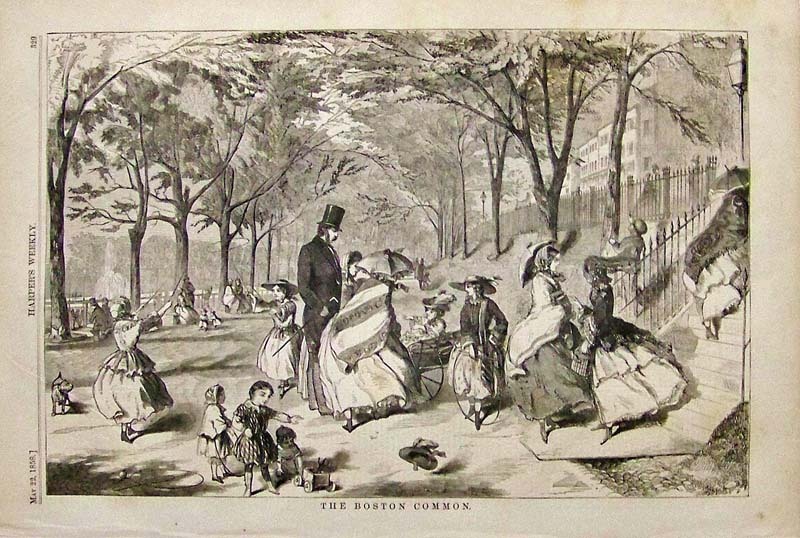 1858 Winslow Homer wood engraving titled, "The Boston Common." Featured in Harper's Weekly, this image shows people at leisure under a grove of trees. 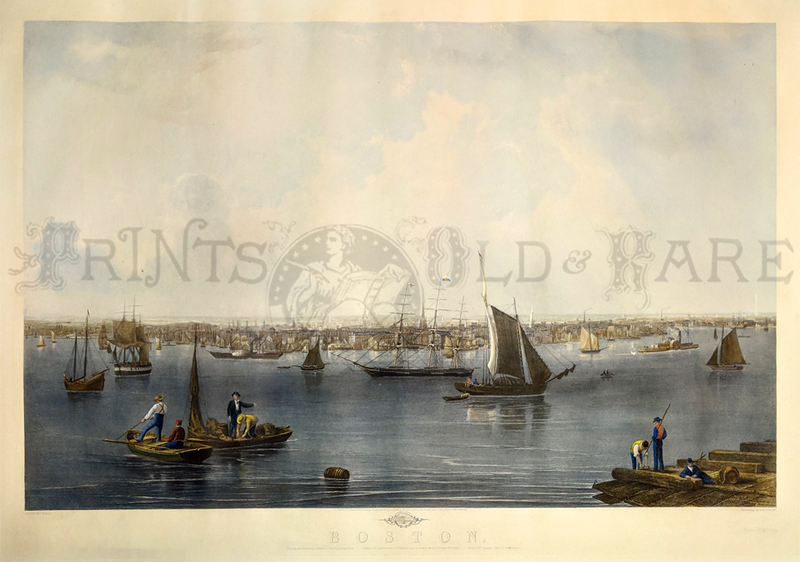 1857 Boston Harbor - Fine hand colored reproduction showing the Boston Harbor. Drawn by John Williams Hill and engraved by Charles Mottram. 1879 Bunker Hill with Key to Participants after Trumbull's famous painting. Hand colored steel engraving. 1013bo: 1905 Large Boston Map. Color: Printed in Color. 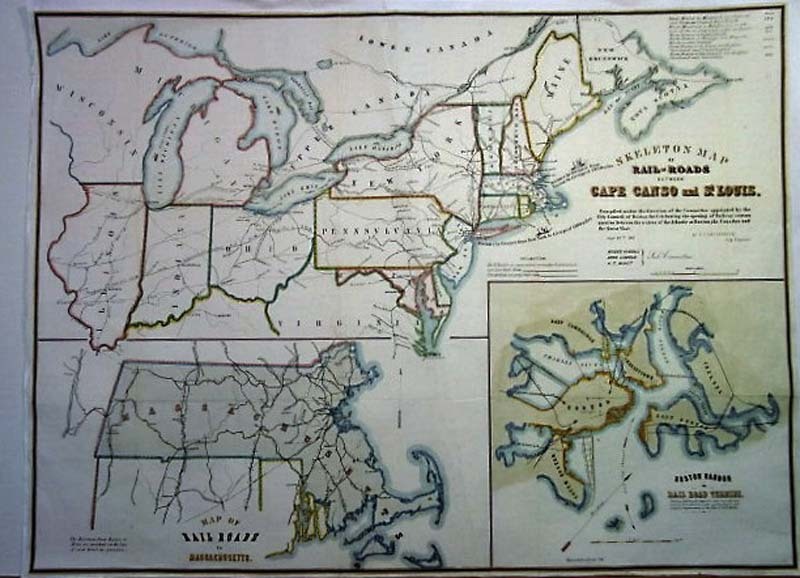 Skeleton Map of Railroads Between Cape Canso and St Louis 1851 Tappan and Bradford - Wonderfully colored lithograph, three large maps on same sheet. 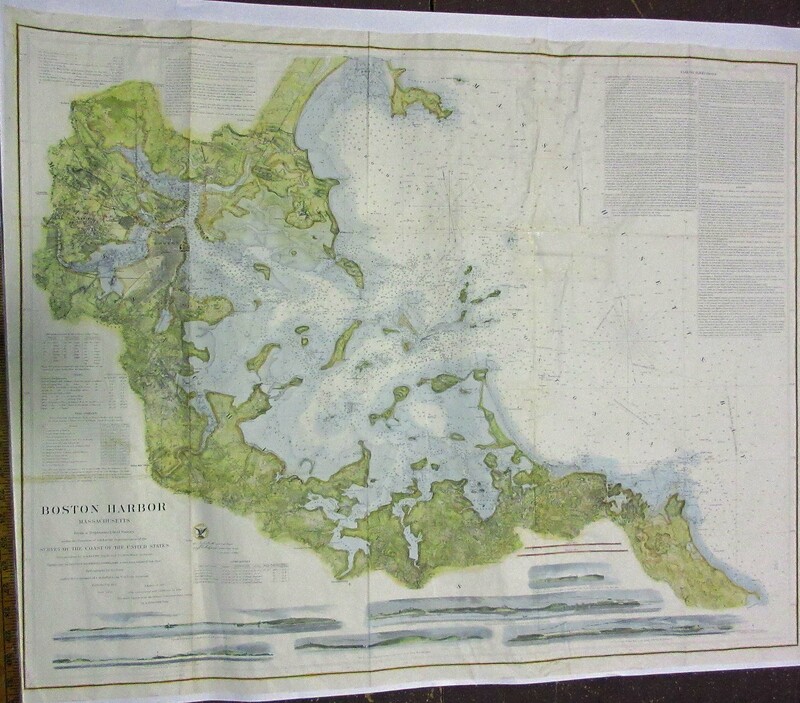 Includes as inset: "Map of rail roads in Massachusetts. 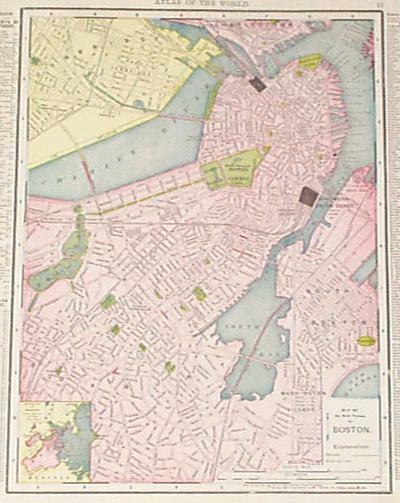 The distances from Boston in miles are marked on the line of each road in operation." Also large inset lower right: Boston Harbor & Rail Road Termini. Showing facilities for shipment and internal transmission of merchandise with existing wharves and proposed improvement of the flats at South Boston. The proposed improvement included filling in a large section of South Boston and constructing new docks and a horse track to connect wharves and railroad depots. Locates within the city the 'termini' of the Old Colony, Boston & Providence, Boston & Worcester, Lowell, and Maine railroads. Condition: Excellent, great vibrant color, folds hardly visible. size 31 x 23.5 image.